Discovering potent and selective kinase drugs is a challenging endeavor. Setting up and completing a screen of a new drug target against a compound library can take several months to a year, and there’s not always a full understanding of off-target liabilities of the hits. Our company’s founders knew there had to be a better way. Their idea: build a high-quality kinase inhibitor library – without having a particular target in mind – and screen them upfront against the entire human kinome. When a new kinase disease driver is discovered, our kinase inhibitor library can help us quickly identify promising starting points for a drug discovery program. At the American Association for Cancer Research Annual Meeting, I presented how our research platform helped accelerate the discovery of BLU-667. This experimental therapy potently and selectively targets RET, a kinase driver of disease for subsets of patients with non-small cell lung cancer, medullary thyroid and other tumor types. BLU-667 is one of the first drug candidates we discovered from a starting point in our library. The program rapidly advanced from a target discovery through clinical proof-of-concept; this achievement is exactly what our founders had in mind. It now contains 10,000-plus molecules that are active against a range of kinases. Each molecule’s activity is fully annotated across more than 400 kinases. The molecules come from more than 100 diverse scaffolds (the part that binds to the kinase’s “hinge” region). In aggregate, the scaffolds’ activity covers a large majority of the kinome and can give our chemistry team the ability to choose from multiple starting points. When we identified RET as a promising target, our library provided two clear benefits: we could immediately select high-quality starting molecules, and we could prioritize them based on both their on-target and off-target activity. Right away, we identified sets of compounds from five promising scaffolds. These molecules were potent and selective for RET with minimal activity on other kinases. Such properties offer the potential for enhanced efficacy and reduced off-target safety events. Identifying multiple promising scaffolds from the start gave us a lot of opportunity to determine which was most optimal to pursue further. Having all these options helped us meet our goals. A key objective was to predict which resistance mutations might be acquired from a RET-targeted treatment, and achieve potency against those mutants. Combined with targeted activity against wild-type RET and activating mutations, this approach may help us overcome or even prevent treatment resistance. 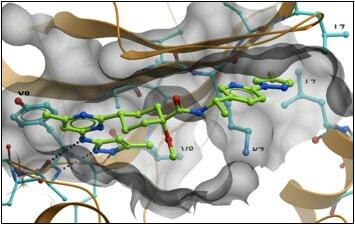 To reach our aims, we reviewed crystal structures to help predict potential resistance mutations. We also conducted in vitro resistance screens with multi-kinase inhibitors to identify RET residues that mutate rapidly. All in all, our goals were ambitious: high selectivity with sub-nanomolar potency against wild-type RET and a range of RET alterations. It was very rewarding when we achieved that target profile and discovered the molecule that’s now BLU-667. I’m proud of the team that discovered and developed BLU-667, and I’m grateful to see this program advance through late-stage development. Recently, our team met a patient with RET-altered non-small cell lung cancer and her family. This experience connected our discovery project to our current clinical program. Patients like her may benefit because of what our team developed, and ultimately, this is why we do what we do. This crystal structure shows how BLU-667 binds to RET.